Jiyo Natural Food Breaks are quick, energetic and nutritious! Indians who go abroad generally come back with a lot of praises about the other countries when it comes to – traffic, hygiene and work culture. At work, the breakfast, lunch, coffee happens mostly at the table or at the cafeteria and the break is as short as it can get! The two things, often mentioned by people who have either worked abroad or visited other countries for work are – you start early and therefore you finish early and one does not take their own sweet time to eat. Of the above, as a health food company, we, Jiyo Natural is interested in the later. Will it ever happen that we can take shorter breaks for food and focus on work? This could create a better work life balance and thus give us more time for our personal and social life. On one hand food breaks are getting longer, hampering work timings, frame of mind and deliverables. People step out of office for lunch or to the cafeteria, taking their own time to return. On the other, there are some members who treat cafeteria like an extended office and have high level trainings and important discussions over food breaks.
? Isn’t it wonderful that instead of stepping out of the premises (Remember, out of sight is out of mind), it’s good to have food within the premises of the organisation that helps them to be in the same frame of mind? If you are facing the same challenges listed here, its time to look into Jiyo Natural food options provided exclusively to corporate members.
? Jiyo Natural food is healthy in the true sense: We have a strict policy of no refined products (like maida and sugar) or trans fats in our recipes (or for that matter even in our kitchen). All the food is prepared from whole grains, healthy oils and jaggery. What results is - a dish that is low on glycemic index, high on fiber and keeps you healthy and energetic.
? Jiyo Natural caters to all organisations in Bengaluru: Jiyo Natural provides breakfast, lunch, snacks and dinner to any type of organisation in Bengaluru. Be it a start up (30 – 40 employees), a mid size company (100-300 members) or a large organisation (300+ members), Jiyo Natural is geared up to handle all types of numbers without compromising on quality or the nutritional balance in food.
? Jiyo Natural food comes in tiffin carriers and quality food trays: If space is a constraint and you do not have spare resources to serve food at cafeteria, Jiyo Natural is your answer! Jiyo Natural food comes in tiffin carriers giving you a feeling of home food, having eight varieties of food on all days. Jiyo Natural food also comes in food trays that is compact and saves you the trouble of cleaning or setting it up. 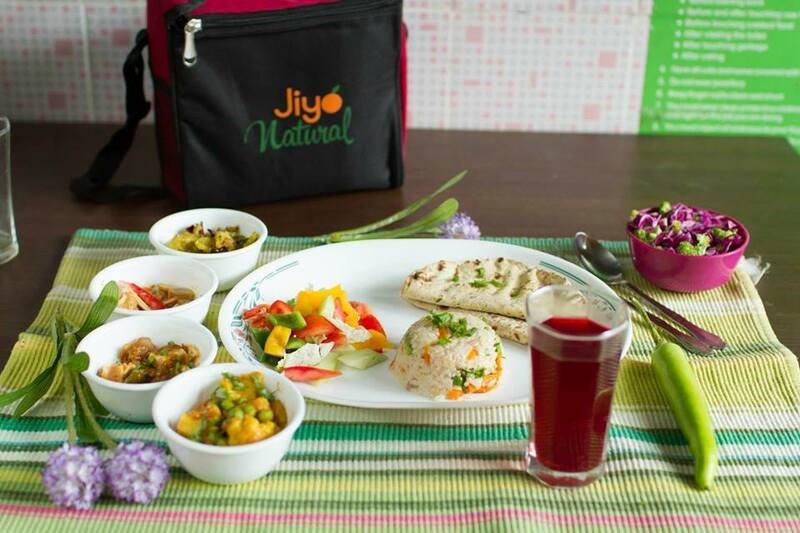 ?Jiyo Natural food is pocket friendly: Jiyo Natural breakfast, lunch, snacks and dinner are pocket friendly and cost anywhere between Rs 55 to Rs 220 depending on the spread, logistics and the number of packs. Jiyo Natural understands that food (even though being the only contributor to health as an external factor that is under control) cannot be a burden to either the organisation or the consumers. As much as, all Jiyo Natural foods come with perfect nutrition balance, best quality, taste and variety, the emphasis is also on - being pocket friendly.